Ohkawa: We created X as a manga, so we wanted to see how far we could use the cinematographic scenery. A manga is composed of still images and has to rely on dialogues, but then if we make it too explicit we might bore the reader. It’s the turning point from which Kamui begins to change. Igarashi: Like a bitten dog fleeing, tail between the legs (laughs). Mokona: In his first appearance, it’s like is branded “crazy dog”. Since the readers weren’t that mad of him, we took our precautions. Nekoi: It was more Kamui who was mad (laughs). Have the readers reacted differently? Ohkawa: In these scenes, it was less Kamui than Kotori who marked the readers. In her first appearances, she was unanimously loathed (laughs). She was the typical shoujo manga heroin, with no particular characteristic… In a way, her only characteristic was to be pretty. But as the plot unfolded, as the painful events of her childhood were revealed, as she began to become insane, while she still did her very best, the readers changed their mind. Her popularity ranking changed direction in the right way. Mokona: But from our point of view, it was more like “finally, we are there”. Ohkawa: Finally, the gong has rang, the battle may begin. I think if I were to redo X now, I would shorten the part before Kotori’s death. Mokona: But then, we would see Kotori even less .. poor thing … (laughs). Ohkawa: (laughs) In the extreme, we could make her appear only as flashbacks… It’s true she would appear far less. On the bright side, Fuuma’s personality would change faster. Igarashi: As long as his personality doesn’t change, the story is blocked. Ohkawa: Finally, if I were to redo X as I am now, I would shorten the totality of the story, despite the care I used until now. After all, to set Kotori and Fuuma in the readers’s mind, 8 volumes were necessary. Although these 8 volumes would have been decreased to three now (laughs). Ohkawa: Not only daddy Kyougo-otousan but all the story would be shortened. Ohkawa: Indeed, I remember we didn’t have much time for ourselves back then. Igarashi: It was rather hard. Mokona: Still, even though it was sad for Kotori, in a way, I was glad to draw the scene of Fuuma’s change. Nekoi: Since the only thing Ohkawa told us was this change in Fuuma, we were curious to see how this change would take effect. So, you were eager to reach that scene… Was Fuuma easier to draw after his change? Ohkawa: He was quite hard to get before. Nekoi: He was always looking away (laughs). Igarashi: Even as he pat Kotori’s head, he seemed to be looking somewhere else (laughs). Ohkawa: I think for the readers, this Fuuma was hard to get. Because he almost never talks? Ohkawa: We created a lot of silent characters, but this one is even worst. Usually, there is always a scene in which we see, even though they say nothing, that they are good people. But Fuuma only appears in scenes that are focused on Kamui and we couldn’t add that kind of episode. Mokona: Since the character he now has is the true raison d’être of this character, we were really eager to get there. I really got a felling of achievement when I drew this scene. Plus, the story evolves abruptly around the volume 8. Ohkawa: Yes, for example, Karen appears. I love the scene in which she appears. Igarashi: Always wearing lingerie (laughs). Ohkawa: Speaking of which, for the movie, Rintarou came to ask me what he should do for her clothing (laughs). He was unable to imagine her wearing something other than lingerie (laughs). Nekoi: After all, she’s like this because she comes out of office. Mokona: She sneaked out quietly. Igarashi: I wonder if Sora-chan went to the soapland from the business card (laughs). Mokona: At first, there was supposed to be an episode in which Sorata and Kamui went to the soapland. Ohkawa: That’s why we asked our editor to gather information on these (laughs). Ohkawa: But the scenes would have had to be published in a seinen magazine, so… though I would have liked it too (laughs). Ohkawa: In the beginning, I thought to use the CLAMP Gakuen as a place to store the sword, and it appeared like that. But when we wrote the name of the CLAMP Gakuen, it was already a gag (laughs). 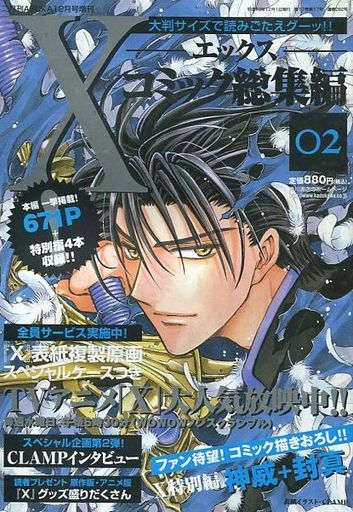 The CLAMP Gakuen was created for for X all along? Mokona: Me, I don’t regret it, we had fun (laughs). Will we see the three of them? Mokona: Is it an inn? Nekoi: They are going there to talk with people and look for information, and they have to think to save when they talk to Nokoru (laughs). Translated from Japanese by unknown (claim this translation). Interview originally published in X ASUKA Compilation vol. 2 (Kadokawa), released on December 01, 2001. If you found mistakes in this translation or would like to contribute with translating other interviews, please contact me. Kobato. 2010 Calendar cover, Mokona marrying Fuuma?